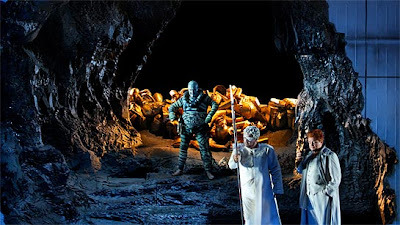 Tankred Dorst's production of Der Ring des Nibelungen at the Bayreuth Festival is now history. The last Götterdämmerung was performed on 25 August 2010 with a marvellous Lance Ryan as Siegfried and a Festival orchestra I have never heard better. From day 1 this has been Christian Thielemann's Ring, and the orchestra has responded with better playing for each year. The quality of the singer-actors (to the extent that acting was necessary in this Ring), on the other hand, has varied. For me the highlights has been Eva-Maria Westbroek's Sieglinde, Arnold Bezuyen's Loge, Gerhard Siegel's Mime, Lance Ryan's Götterdämmerung-Siegfried, Johan Botha's Siegmund (best enjoyed with closed eyes), Kwangchul Youn's Hunding and - of course - Andrew Shore's outstanding Alberich. The director, Tankred Dorst, has received massive criticism, both from the press and the merciless Bayreuth audience. It's not even a secret that some of the principle singers has had very little regard for the production. To me the worst thing about this Ring was the helpless and amateurish stage instructions. More often than not, the only instructions the singers seem to have received was how to move to be faced toward the auditorium when it was their time to sing. Two years ago I heard an interview with Dorst where he said that he wasn't interested in the criticism his Ring production had received. That is the most serious flaw about this Ring - it was not developed to reach an acceptable level during the years it was on the programme. That a Bayreuth production has flaws the first year is to be expected, but the wonderful thing about the festival concept is the opportunity the stage director has to constantly refine it for each year. Dorst refused to use this opportunity. As a consequence Dorst was vociferously booed when he came out before the curtain after the last performance. I am not sure that he was prepared for that. One would think that the Bayreuth audiences would show the old man some mercy on the funeral day of his Ring, but no. Even though I find this behaviour inappropriate and even unacceptable on the day of the final performance, I find it just as unacceptable that the director's team didn't do more with the material they had to their disposal. I actually cannot think of one scene in this whole Ring production that inspired me to think about what this drama is all about. A postcard production, some called the Dorst Ring. And that is what it was. Some of the sets were really beautiful: the Rhine, the Nibelheim with its treasure vault, the final scene of Die Walküre. These images will live, but the production is best forgotten as soon as possible. It is a scandal that Die Walküre is scheduled to be released on Bluray/DVD later this year instead of the groundbraking Parsifal production that is now even being admired by lots of people who don't like Regietheater at all. If you got more out of this Ring than I did, or you have any other comments, please leave a comment below! Fanfare before Lohengrin Act 3 at the Bayreuth Festival 2010. Klaus Florian Vogt replaced Jonas Kaufmann in the Neuenfels "rat production" of Lohengrin on 22 August and set new applause record for 2010 with 35 minutes. It's old news now, but Kaufmann will not return to the Green Hill next year. Klaus Florian Vogt will replace him and sing both Walther von Stolzing and Lohengrin.